She is an embodiment of Shakti or Power and is venerated as the Mother of the Universe, a symbol of female strength in two aspects, the preserver of good and the destroyer of evil. She is the divine consort of Shiva and is worshipped across India in various forms corresponding to her dual and complementary aspects: preserver and benefactor of goodness as well as destroyer and eliminator of evil and wrongdoing. Her most magnificent name is Simhavahin meaning “she who rides astride the lion”. She is usually enshrined in a depiction of an idol of rare beauty, adorned in rich red and golden sari laden with gold ornaments on her head and her body. Her hair is long and luxuriant, open tresses and shining eyes as she rides astride a ferocious lion. On her head is a crown (karandamukut) and in her ten hands she holds different objects including a trishul or trident with which she kills the demon Mahishasur. Durga Puja was first organised by the rich Bengali landowners or Zamindars, in 1757 to honour and welcome Robert Clive . The man who initiated it was Raja Nabakrishna Deb of Calcutta. After this a practice of elite people organizing their own household pujas became the norm but many common people were excluded from these festivities. By the early 20th century the concept of the public or community Puja had evolved called the “sarbojanin” puja and this included people from all castes, creeds and ranks of life. Puja became a great social leveller and a unifying force in the country. Today Durga Puja is an important socio-cultural event in the state and in the country. A monster called Mahshahur had terrorised the world. He was half-man and half-demon. Neither Vishnu nor Shiva could vanquish him. Thus Shakti was invoked by them and Durga was created to battle Mahishasur. Durga rode on a lion and carried several weapons in her several hands. Finally she killed Mahishasur and restored heaven back to the Gods. Since then she is seen as a symbol of the female strength and is venerated for the victory of good over evil. Even in the Vedas and Puranas, Durga has been mentioned as a deity worthy of reverence and adoration. In the whole of India Durga Puja is celebrated with faith and gusto for ten days as the festival of Navratri beginning with Ekadashi and ending with Dussehra. Yet in West Bengal it is celebrated from the day of Mahalaya. Mahalaya is the first day of autumn and begins after Janmashthami ends. It brings in the pervasive festive spirit of Durga Puja. Durga to visit the Earth which is regarded as the paternal home of her as a married lady visiting her parents along with her children, only to return to her husband’s home by immersion in the ocean after ten days of festivity and gaiety. On the day of Mahalaya, people line up on the banks of the Hooghly and engage priests to chant and offer prayers or “tarpan” in the memory of the departed souls of their ancestors. The midnight chants of various hymns of ‘Mahishasur Mardini’ are very stirring and poignant and remind us that Durga Puja is around the corner. 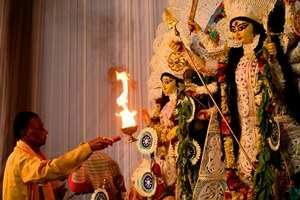 Mahalaya is a very auspicious and holy day. Durga Puja is celebrated with gusto and fervour throughout the country and especially so in West Bengal where it is a massive social event too. Different areas in the state celebrate public puja ceremonies by forming committees of local residents who raise funds through donation and corporate sponsorship plus political involvement and investment. This money goes into commissioning the gigantic idols of Durga, her children and Mahishasur that are created in a place called Kumartuli which is internationally famous for its artisans who make magnificent idols out of mud and clay. The next big expenditure is the construction of theme-based magnificent “pandals” or architectural outdoor canopies where the idols are kept. These canopies or “pandals” are temporary structures erected from bamboos and fibre glass. Within these lights and chandeliers are fitted and the deity is housed upon a huge platform visible from miles beyond. Nowadays theme-based “pandals” on Harry Potter, monuments of the world, Doraemon, etc. are the rage and competitions called “Sharadiya Saamman” are organised by Asian Paints to give away the grand prize to the committee with the most creative and innovative puja pandal. The last five days of the festival are most important. They are respectively called “Shoshthi”, Saptami”. “Ashthami”, “Nabami” and “Dashami”. Each of these days has a special puja and the evening has what is called “shondhi pujo.” The air is filled with the sound of “dhakis” or drummers playing a special drum and the priests chanting the holy mantras. There is a special dance called “dhunuchi naach” with small containers of burning and fragrant coal and incense to perform the rituals before the goddess. It is believed that the more idols people visit, the more the goddess will be pleased to grant blessings upon the people. So all over the state people visit various idols from early morning till late at night and call this “thakur darshan” or seeking the blessings of the deity. The entire atmosphere is festive, happy and spiritual. The concept is that Maa Durga has visited her parental home on Earth and on the tenth day or Dashami, she will be returned to the oceans to be united with her imperial consort Shiva. That is why the idol is dressed in red and adorned with sindoor which is called “shringaar” or “boron” and then carried off for immersion which is called “visarjan”.